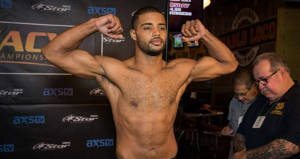 Trevin Giles in the undercard looked fantastic. He was a pretty strong favorite at -250 according to 5Dimes but most insiders including myself thought he should have been a bigger favorite than that. If you watched the fight, Giles intentionally wanted the fight to get out of the first round as his opponent James Bochnovic had never been out of the first round. But Giles could have finished it in the first round if he really wanted to. Doesn’t matter too much, he turned up the juice in the second round and got a knockout with his ground and pound. James was knocked out cold by the ground and pound and stayed asleep for quite some time (he eventually got up to take a seat on his stool several minutes later so he appeared ok). Giles is a guy to keep an eye out in the future. He will be dropping some weight and fighting at middle weight next time but he absolutely will not lose any of his power when he does so. 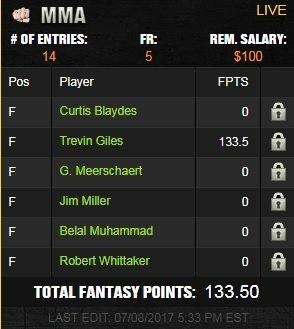 Giles scored 41 significant strikes, 5 takedowns, 6 advances, and got the 2nd round knockout for a whopping 133.5 fantasy points. The next prelim fight showed another fantastic prospect with Cody Stamann. Stamann was a -245 favorite and just looked fantastic against a tough, game opponent in Terrion Ware. Stamann was adept at his stand up but extremely powerful with his wrestling and takedowns. He won every single round (in my opinion and two of the three judges) on short notice and with his juggernaut-like takedowns. Though this fight went the distance, he was in total control. At the end of the 3rd round, he bit down and just threw bombs against the striker, and then finished with another juggernaut takedown. Fantastic looking fighter. Do you play fantasy UFC? 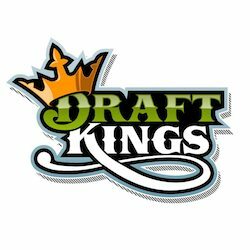 Click here to sign up to DraftKings! Read our review of the DraftKings welcome bonus here.